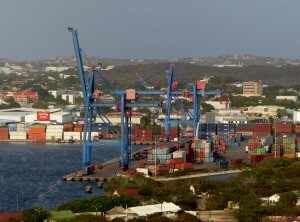 WILLEMSTAD - In accordance with the concession agreement signed between Curaçao Ports Authority (CPA) and Curaçao Ports Services (CPS) in 2016, CPS has initiated the purchase of two new cranes to replace the current ones. The Minister of Economic Development, Mr. Steven Martina, emphasized the importance of the impact of the port, and especially of the container terminal, on our economy and indicated that he is satisfied with this investment made by a local company, being CPS, in order to guarantee the continuity of the container services for the coming years. The cranes are from the brand Kalmar. CPS’s planning indicates that the cranes will be operational in 18 months. The acquiring of the cranes is a modernization of the port and will be a great contribution to our economy.